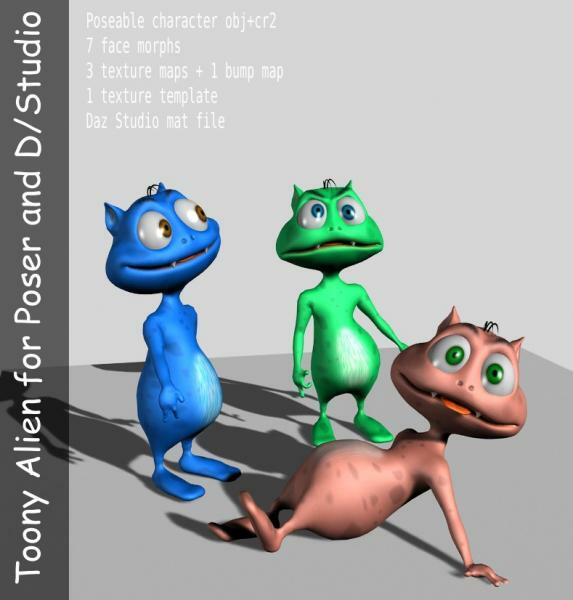 Poseable original toon character for Poser and Daz/Studio. Texture template and Daz/Studio materials settings included. So cute, thank you very much. luv2create (3 years ago) Inappropriate? Kbentonkb (6 years ago) Inappropriate? Wow great character. Thanks for all the work you do and the free stuff you give us! Amo esses criaturas eles sÃ£o fofos. Ghostpanther (8 years ago) Inappropriate? Cuter than any other alien I've seen. Yokasobi (9 years ago) Inappropriate? Rapunzl (9 years ago) Inappropriate? pigfish9 (12 years ago) Inappropriate? He's absolutely adorable! Thank you. livingos (12 years ago) Inappropriate?